Ten years ago today — June 5, 2002 — Space Shuttle Endeavour launched from the Kennedy Space Center on a mission to the International Space Station. The STS-111 crew consisted of US astronauts Paul S.Lockhart, Kenneth D. Cockrell, Franklin Chang-Diaz, and Peggy Whitson, French astronaut Philippe Perrin, and cosmonauts Valery G. Korzun and Sergei Y.Treschev. 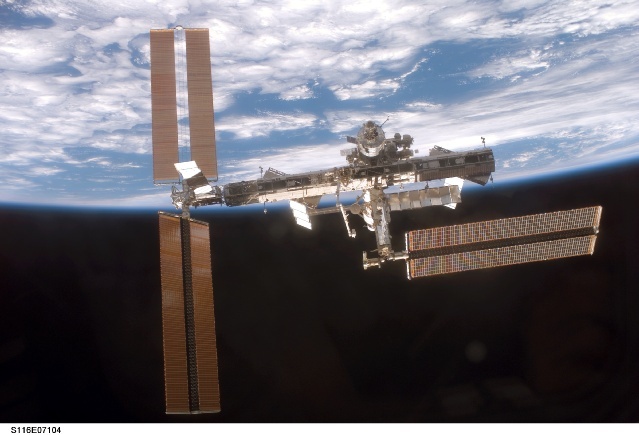 Korzun, Treschev, and Whitson comprised the ISS “Expedition Five” crew, and stayed aboard the ISS when Endeavour departed with the Expedition Four crew. Endeavour delivered supplies and equipment to the ISS, and returned unneeded hardware and materiel from the station. 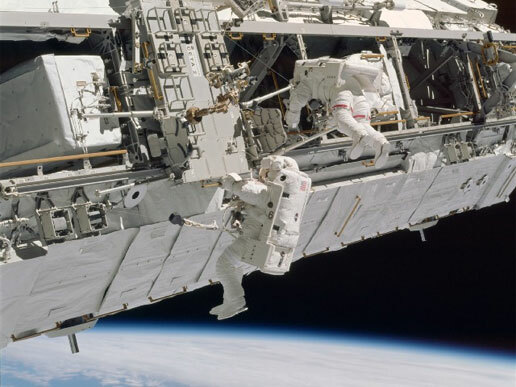 In a series of EVAs, the crew installed the Mobile Remote Service Base System on the Mobile Transporter, which extended the Canadarm2 robotic arm’s reach by allowing it to traverse the station’s length. They also replaced a wrist roll joint on the station’s robotic arm. This foray into space history wouldn’t be complete without noting how good it was to see SpaceX‘s Dragon space capsule become the first commercial vehicle to dock with the space station. Well done! Twenty-five years ago today — May 15, 1987 — the USSR launched its first Energia rocket from the Baikonur Cosmodrome. The Soviets had originally announced that the launch as a successful sub-orbital test of the new Energia booster with a dummy payload, but some time later it was revealed that the flight had, in fact, been intended to orbit the Polyus, a UKSS military payload. The two stages of the Energia launcher functioned as designed, but the Polyus payload failed to reach orbit. Due to a software error in its attitude control system, the burn of the Polyus’ orbital insertion motor failed to insert the payload into orbit. Instead, the payload reentered the atmosphere over the Pacific ocean. It would seem that Polyus is the Soviet response to the project “Star Wars” launched by the American president Reagan. It was to be in fact a space combat laser station. Finally, we know very few things about this apparatus and its real use. Officially it was intended to make scientific experiments in upper atmosphere. Ten years later — on this date in 1997 — the Space Shuttle Atlantis launched from Kennedy Space Center on mission STS-84. The shuttle carried U.S. astronauts Charles J. Precourt, Eileen M. Collins, C. Michael Foale, Carlos I. Noriega, and Edward T. Lu; French astronaut Jean-Francois Clervoy; and Russian cosmonaut Elena V. Kondakova to the Mir space station. Foale stayed on Mir, and the shuttle brought astronaut Jerry Linenger back to Earth after his 123-day space station stay. Quite a contrast with the cold war days. Thirty years ago today — May 13, 1982 — the USSR launched a Soyuz-T from the Baikonur Cosmodrome, carrying the first crew to their newest space station. Mission Soyuz T-5 launched on (of course) a Soyuz rocket, carrying cosmonauts Anatoli N. Berezovoy and Valentin V. Lebedev. As noted on the Wikipedia page, it was the first mission to the Salyut 7 space station, which had only been launched a few weeks earlier. Today’s space history starts a half-century ago — on April 25, 1962 — with a Saturn-1 suborbital test launch out of Cape Canaveral. Having nothing to do with clouds, on April 25, 2002, Soyuz TM-34 launched from the Baikonur Cosmodrome on a ferry flight to the International Space Station (ISS). In addition to its working crew of Russian cosmonaut Yuri P. Gidzenko and Italian astronaut Roberto Vittori, it carried South African Mark R. Shuttleworth as the second commercial space tourist. Thirty years ago today — April 19, 1982 — the Salyut-7 space station launched from Baikonur on a Proton-K rocket. Similar to Salyut-6, Salyut-7 was the latest in a series of space stations orbited by the Soviet Union. Its overall structure — two docking ports, carried three solar panels — were quite like Salyut-6, though the telescope used in Salyut-6 was replaced on Salyut-7 with an X-ray detector. Salyut-7 hosted six resident crews and four transient crews over its operating life. The station fell back to Earth on February 7, 1991. Ten years ago today — April 8, 2002 — the Space Shuttle Atlantis launched from Kennedy Space Center on its way to the International Space Station. STS-110, also known as ISS Assembly Flight 8A, featured astronauts Michael J. Bloomfield, Stephen N. Frick, Jerry L. Ross, Steven L. Smith, Ellen Ochoa, Lee M.E. Morin, and Rex J. Walheim. The team completed four spacewalks during their 10 days in space, and delivered and installed the “Starboard-Zero” Center Integrated Truss Assembly. The new truss was a key part of the ISS’s skeleton — its “center backbone,” according to this STS-100 information page — with attachment points for additional station modules and solar panels. In addition to mechanical attachments, the truss included power and thermal control systems, a Mobile Transporter to extend the reach of the station’s robotic arm, as well as other equipment needed to keep the station operational. The launch marked a milestone as Mission Specialist Jerry Ross became the first human to fly in space seven times, breaking his own and other astronauts’ records of six space flights. You know, some of us would be satisfied with getting to fly in space just once. Five years ago today — April 7, 2007 — Hungarian-American software executive Charles Simonyi blasted off on the first of his two tourist trips to the International Space Station. Soyuz TMA-10 lifted off from the Baikonur Cosmodrome carrying Simonyi and cosmonauts Oleg V. Kotov and Fyodor N. Yurchikhin. Simonyi, who made his fortune as one of the primary developers of the Microsoft Office products Word and Excel, spent about 2 weeks in space before returning to earth aboard TMA-9. That would not be Simonyi’s only trip to space, however: In March 2009 he returned to the ISS aboard TMA-14. Ten years ago today — February 5, 2002 — a Pegasus-XL rocket launched a solar flare observatory into orbit. The Pegasus’s L-1011 carrier aircraft flew out of Cape Canaveral for this launch. 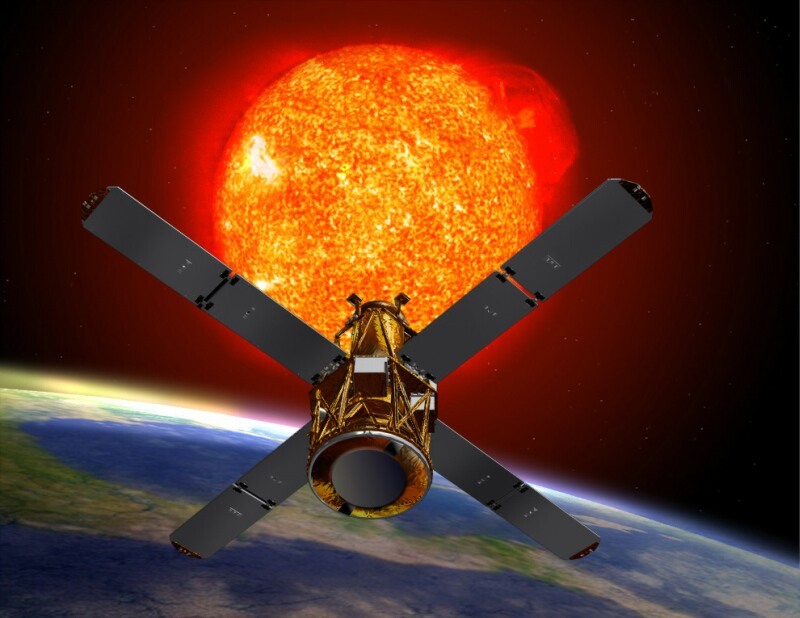 About two months after being launched, the High Energy Solar Spectroscopic Imager, or HESSI, was renamed the Reuven Ramaty High Energy Solar Spectroscopic Imager (RHESSI). It is still on-orbit and functioning today. As some folks know, the Pegasus is special to me because I was on the Flight Readiness Review Committee for the first-ever live launch. And this seems a timely bit of space history, given the big solar flare that occurred about a week ago. And in bonus space history: on this date 25 years ago, cosmonauts Yuri V. Romanenko and Aleksandr I. Laveykin launched from the Baikonur Cosmodrome on mission Soyuz TM-2. Romanenko eventually spent 326 days in space aboard the Mir space station, establishing a world record. Ten years ago today — December 5, 2001 — the Space Shuttle Endeavour launched from Kennedy Space Center on a mission to the International Space Station. STS-108 delivered the Raffaello Multi-Purpose Logistics Module to the ISS. Astronauts Dominic L. Gorie, Mark E. Kelly, Linda M. Godwin, and Daniel M. Tani attached the Italian cargo module to the ISS’s Unity module, and ferried the ISS Expedition 4 crew — cosmonaut Yuri Onufrienko and astronauts Carl E. Walz and Daniel W. Bursch — to their new orbital home. When Endeavour landed, it brought the ISS Expedition 3 crew — astronaut Frank Culbertson and cosmonauts Mikhail Tyurin and Vladimir N. Dezhurov — back to Earth. I’ve noted elsewhere on this blog that I met Captain (USN) Culbertson several years after his return from the ISS. I sat next to him during a day-long NASA Industry-Education Forum. Good guy.